Hey guys! We adore this soup at our house, and yes even our littlest toddlers do too. It's very addicting, and as Emily said, a huge perk of making it is large quantities is that it freezes and reheats so well, which helps a ton when days are extra busy. A quick little background about borsh: there are many different variations that come from different countries, and with different spellings. Most have this beautiful deep red broth that comes from beets, while others are made with a tomato base, and some neither. Some are served hot, some cold. 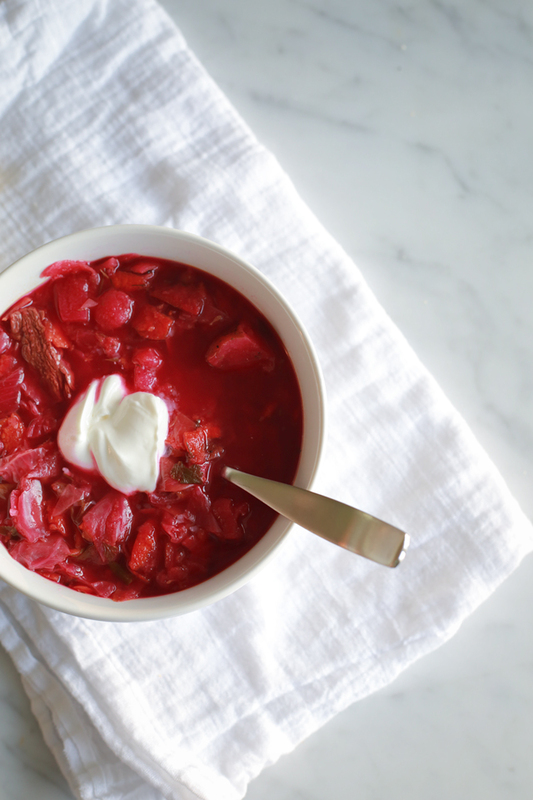 In Romania particularly, borsch(borscht) can be a sour soup, or a liquid ingredient for sour soups made from fermented grain found at most food markets. They can be the simplest form of survival food made from a few vegetables, or a rich deluxe variation with all the favorite ingredients such as this one. Enjoy! Grate up your beets and carrots, and set aside. In a large soup pot brown the chopped onions in olive oil. With pot on medium high, add your grated beets, carrot, and diced tomatoes to the pot and add 6 cups of water (also, continue to add water throughout the process if needed in keeping up to the level of ingredients). Cube your potatoes and add. Prepare your meat and add. Pre-season the broth with 3 Tablespoons salt, all dry seasonings, and ¼ cup lemon juice. Simmer for 30 minutes. Shred cabbage and add. Add frozen peas. Finely chop parsley and dill and add. Simmer for 10 minutes. Season to taste with salt and lemon juice. The level of sourness varies to taste, but will diminish in the broth as it is absorbed by the ingredients. Cook on a low simmer until meat is done and potatoes tender. My sister in law is Moldovan; I will have to make this for her! I know it's been a while since you've commented, so I just wanted to check in and see if you ever had a chance to try it out! This looks amazing! I'm in my first trimester with my second right now and food doesn't always sound appealing, but this I want. YUM. Thanks for sharing! I've been following your blog for a while and have to say I really enjoy all of it: the ups and downs, the fun and the serious, the beautiful and the painful. Keep up the great work! I am Ukrainian and must say that your borshch looks almost exactly like mine. We do not add peas, although some people, including my mama, like to add beans to thicken the soup. Ukrainians make a huge variety of borshch, and while I enjoy the vegetarian tomato based orangish kind, I prefer the meaty, deep burgundy, fried beet sort. Just had my last bowl of it today. Perfect for fall time. If Martin hasn't yet tasted the green variety of borshch made from sorrel leaves, the sister soup of the traditional red, but lighter and more of a refreshing variety, he and you definitely must. Thank you for featuring something so different and authentic. Brought a smile to my face. Growing up my parents served us lots of borshch...now my sister carries on the tradition and each and every one of my kids grew up loving it. They still love to go to their aunt's to polish off bowl fulls of it. Glad to see your family appreciates it too! Yes it's such a treat! That's such a neat thing to have little kids loving it and especially as a tradition. Thanks for stopping by! I am from Romania and i love bors!